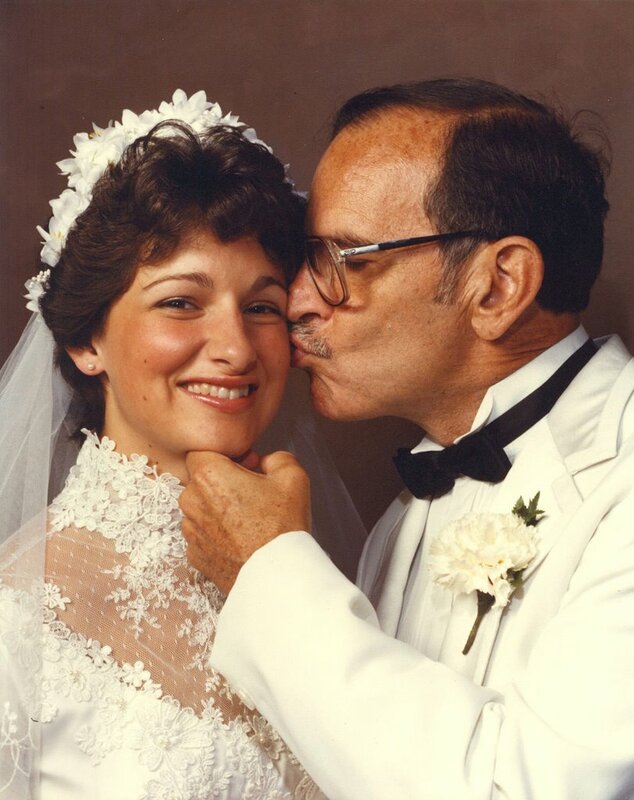 Parenting editor, Dr. Flaura Winston, with her father, Arthur Koplin (of beloved memory) in 1983. My father died years ago when I was in my twenties. He had just turned 60. I was newly married, just beginning my life with my husband. It was several years before the birth of our first child. My father would have loved my children and they him. Despite the passing of more than two decades, I can remember his kind face and smile as if he were in front of me today. I see his agreeable and supportive personality live on in my older son (age 19). I see his undying quest for knowledge and love of current events and science live on in my younger son (age 14). At each family milestone, I feel his presence and pride. I want to share this warm feeling with my children, but it is difficult. How do I convey his understatement, his devotion to his family, his beautiful white smile? This year was particularly challenging as his yahrzeit (Hebrew calendar anniversary of the death and commemoration by the mourners) nearly coincided with Father’s Day. As I watched my children celebrate Father’s Day with my husband and father-in-law, I recounted the years of joy that my father missed. A life cut short - not only for him, but also for us. I am so grateful for the tradition of yahrzeit so that I keep his memory alive and continue to honor him and his life. In years past, yahrzeit services were my private time with my father. I recited kaddish, the Mourner’s Prayer, and lovingly gazed at his memorial plaque, lit in the sanctuary during the week of yahrzeit. I reflected on his kindness and our wonderful relationship. Starting when my children were young, I made yahrzeit at home a family tradition. My children see my sadness and are kind to me, but they also feel my love for my father and the joy I feel in remembering him. I show pictures of my dad and share stories. I tell my children which traits of my father I see in them. (They jokingly compete on who has which trait.) This year, now that they are both Jewish adults, I encouraged them to attend services with my husband and me – to support me and to honor my father. They helped make the minyan. (My father would have been proud!) My younger son helped me find the memorial plaque. Maybe, they felt his presence and shared in the warmth that I continue to feel from my father. Perhaps they learned that the strength of the Jewish community will help them get through difficult times as it helped me. I value many things about the wisdom of Jewish observance. Managing the grief associated with death is one I particularly appreciate. The decreasing intensity over time of observance by a Jewish mourner seems to match the decreasing intensity of the grieving process. As noted by the psychiatrist, Dr. Elizabeth Kübler-Ross, there are five stages of grief that end with acceptance. Judaism helped me to go through the stages and accept the loss of my father in a gradual, kind way, but to go further and continue to feel the joy of my relationship with my father in my life. In the immediate aftermath of my father’s death, I felt the loss of someone who loved me unconditionally. The seven days of shiva allowed me to begin to come to terms with this loss. Recognizing the importance of returning to normalcy as part of the healing process, Judaism required me to end this intense grieving. As is the tradition, I marked the end of shiva by taking a walk outdoors and then returned to my graduate studies. Recognizing that seven days was not long enough for healing, for an additional period, Judaism required me to recite kaddish as part of daily services. The kaddish prayer does not mention death or mourning. Rather, it states the greatness of G-d and our prayer for peace, including peace of mind. This observance gave me solace. The silent meditation of the amidah gave me designated times every day to remember my father and to continue to heal. The support of the congregation gave me strength. Before long, happy memories replaced most of my sorrow. Yahrzeit became another phase in the grieving process – joyful memory. The acute, intense period of mourning was long over. I accepted my father’s death, but I never want to forget his life. Every year, on a day in the Hebrew month of Sivan, I have a special time set aside to be with my Dad. On the Shabbat before and the day coinciding with the anniversary of his death, I make sure to attend services. Those who are mourning the loss of a relative or friend surround me. Congregants (and now, my children) are there to support me. The rabbi reads aloud my father’s name. It is somewhat like a visit with my Dad, but it is more. It is a public honoring of his life. How appropriate that it occurred near Father’s Day this year. One day, I, too, will die and I hope that my children get the solace from Judaism that I have received. I hope that they learned from me the lessons and wisdom of yahrzeit.